It’s Easter morning and I am up early, drinking coffee and contemplating the day ahead of me. At my age, Easter isn’t what it used to be when I dressed my children in pastels and we hunted for eggs and ate chocolate until our tongues turned a creamy shade of brown. I’m a mother who no longer marks her life in the change of the seasons but in the change of family gatherings and rituals. Now that both Kate and Parker have flown the nest, they can’t always make it home for every holiday, major or minor, so I’m recalibrating what it means to celebrate Easter without my chicks ’round the table. Instead of dying eggs or preparing an elaborate family meal, I spent Easter Eve cooking for a new family that moved nearby. They’re vegans and, having transitioned to a vegetarian diet several months ago, I know how difficult it can be for a family on-the-go to find healthy, meatless meal options in our community. Cooking for others is a small act of neighborliness that perked up what has otherwise been a melancholy weekend. Mom had asked me earlier in that week if I would consider inviting my sister to my Easter meal. Without much consideration, I quickly declined. Mom came to my house anyway — she wanted so badly to spend Easter with Kate and Parker even if I couldn’t find it in my heart to include my sister, P. For the life of me I can’t now explain why I was so thoughtless. It’s a regret I’ll carry with me forever. I had texted P a few days before my trip to ask if she would join Kate and me for lunch. She gladly accepted but then called a few hours before to beg off, saying she felt bad because she didn’t have a birthday gift for Kate and she didn’t have any nice clothes to wear. I encouraged her to come anyway. I told her Kate didn’t care about gifts and neither of us cared how she looks. For the life of me I can’t now explain why I possessed benevolence on that day and so few others. P decided to join us and surprised both Kate and me. She looked well, relatively speaking. (I had braced for the worst after hearing her say she looked terrible.) She was upbeat and funny and generous. Often, her conversation can be hard to follow but, on that day, she was mostly cogent. She was kind and I responded in turn. I can only think Mom had something to do with that. And I can only wish Mom had been present, but then in so many ways she was, moving our hearts even if she couldn’t sit at our table. P gave Kate a small grocery bag filled with trinkets from her home, a sweet if makeshift birthday gift from a woman who has little to share these days. Because we were going to see my father later, she pulled an old photo from her purse to show us. 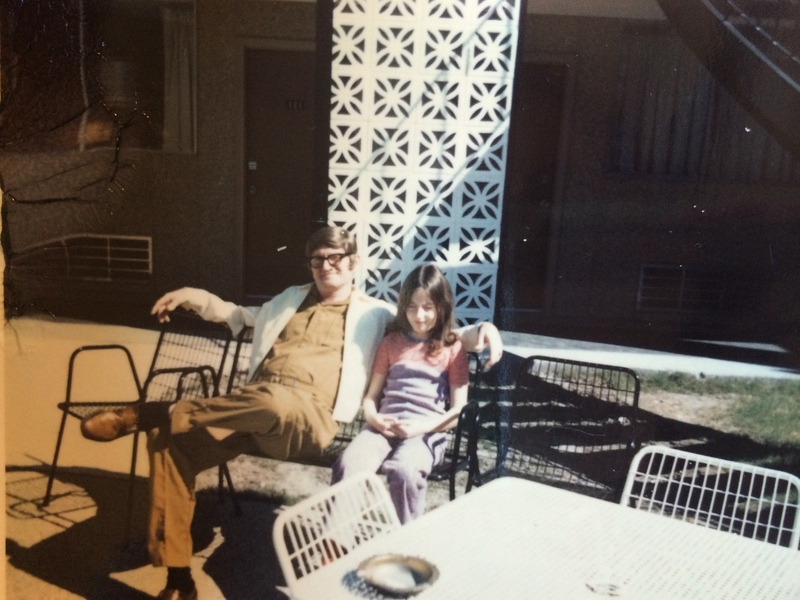 The photo was of my father and me on a hotel patio. I didn’t recognize the occasion but my father later explained we were on a trip to New Orleans, his favorite destination. I also didn’t much recognize the long-haired young girl dressed in purple. Sometimes when I see old photos, or hear my family tell stories about us, it’s as if I am a victim of amnesia and while I can clearly see I’m the girl in the photo, I don’t know her. So much of my childhood is lost to memory — a result, I think, of trying to forget the people and their addictions that threatened to swallow me. When I think of the Easter story, though, I can’t help but contemplate the notion of redemption as it’s played out in my life. I can’t help but think of the resilience of families, even as circumstances threaten to shred any semblance of kinship. I think about how fragile the ties are that bind, and yet still bind. I think about two “half” sisters with different fathers whose mother desperately sought to knit them together and who must have died thinking she had failed at the task dearest to her heart. I think about deliverance, not from evil, but from dissolution, from each other and from God, which is surely as injurious to the soul. I think about P. And me. And our next lunch. « Easing into the year. I refuse to believe your mother died feeling a sense of failure over you and your sister. After reading you here for several years now, I’m convinced she knew in her heart the kindness and charity that so thoroughly encompasses who you are would and will continue to do the work she started to bring your lives into closer orbits. And as you say, while your sweet Mom is no longer physically present to you, your relationship to her is in no way finished. Blessings to you as you stay present in and to these moments, the new life you lead as it unfolds, tethered to but not bound by your past. Deb — your words are an Easter gift of kindness that bring tears to my eyes. “Tethered to but not bound by (my) past.” Such a great way to think of it. Thank you, friend, for your continual encouragement and perspective. And happy Easter! Your beautiful post made me think of this poem by Billy Collins. Ooops. The line spacing disappeared when I pasted the poem. Oh Mdel – this is one of my favorite poems and I hadn’t seen it for years. Thanks for bringing it back to light today! At the risk of sounding like the worst fangirl, I am always so happy to see a blog post from you in my email box. You write so beautifully and share your heart so openly. I also LOVE your IG feed! Happy Easter!